"Thanks for following along with me this month! I am a proud Rochester native, artist, and local art educator specializing in Printmaking and Hand Lettering. The art room was always my favorite place to be in school growing up, and I decided I wanted to be an art teacher in 7th grade. I always had a fascination with handwriting and fonts, but I didn’t discover printmaking until my freshman year at Nazareth College right here in Rochester! I love the way stamp carving is both a 2D and 3D art – how the act of carving a 3D object becomes a tool for creating 2D work. My favorite thing to do is combine both arts by carving words and quotes as well as imagery. Along with running my small business, I teach elementary art at Longridge School in Greece. The Rochester art community is an amazing place to live and work! I love getting to know clients through custom orders and commissions – for ornaments, home drawings, custom quote prints and stamps! Contact me with your ideas and we will work together to make them come to life. 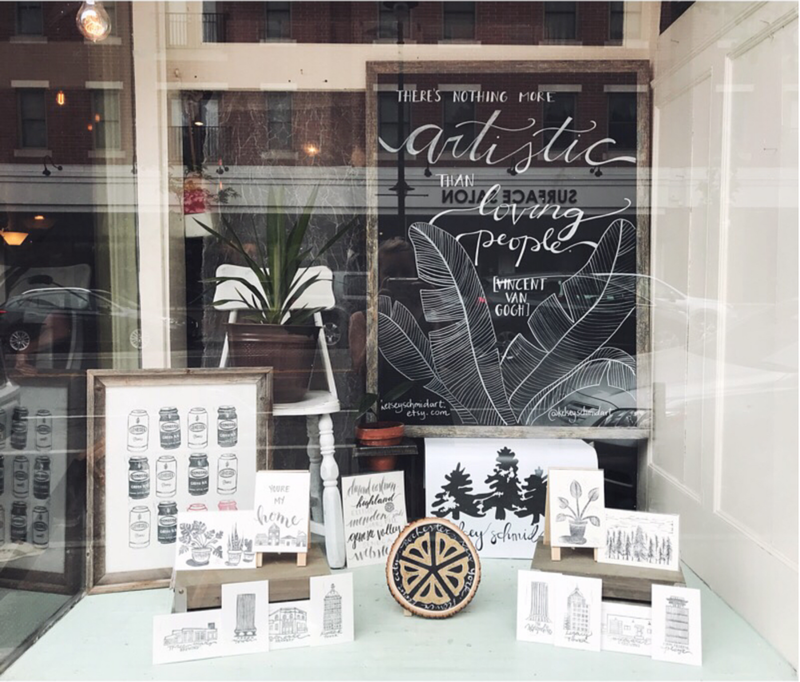 Meet Kelsey and get a chance to take home some of her art at her pop up shop during our June Little Button Sip & Shop on Thursday, June 21st from 5-7pm.